Many bloggers have chosen not to blog due to the recent tragedy that rocked our nation. I am going to instead put up some fun projects to do WITH your kids. Hug them tighter. Spend tons of time with them. Be grateful for what you have. Pray for those that have lost. Donate if you are able. Above all keep living — your own children still need you. My thoughts are constantly in Connecticut but I am here. My kids need a break from the news. I have used a few projects as our escape. I hope y’all can find your peace with the recent events. I have a super simple kid’s craft for y’all today. I figure the kids are driving y’all crazy right about now with questions about when is Christmas going to get here. 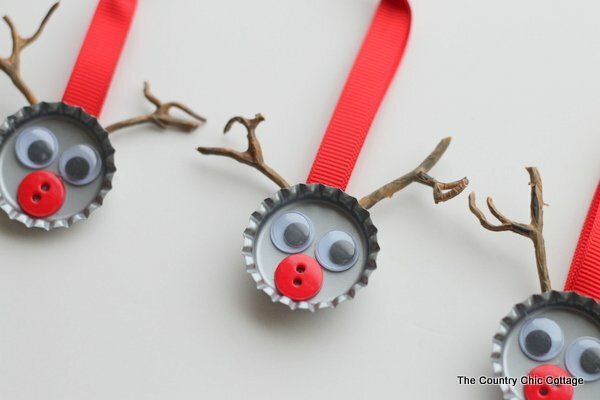 So sit them down and make a few bottle cap reindeer ornaments. Hang them on your tree or give them as gifts. These are so darn simple y’all probably don’t even need directions right? A bottle caps , some google eyes , a red button , some faux sticks, and a red ribbon . Break out your glue and let your kids get creative. Wow these are so cool; would make great ornaments. Looking forward to making them. 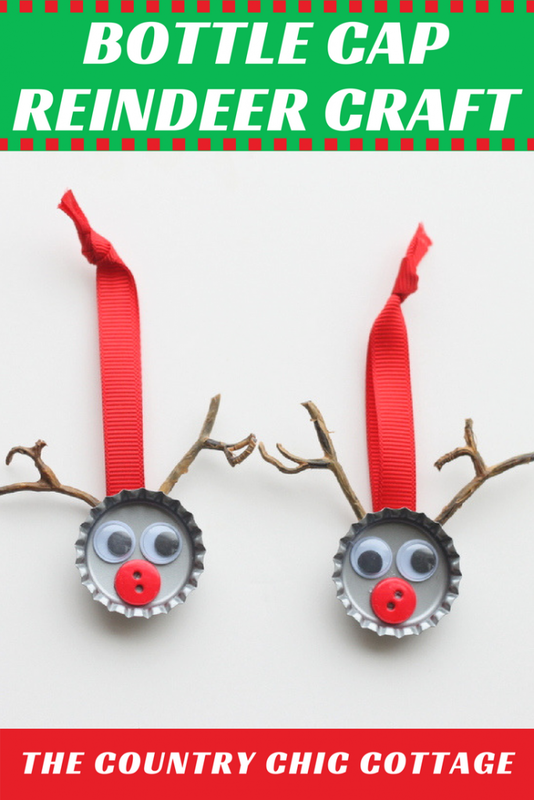 I think I have just found my favorite Christmas craft of the year!! Just posted on Craft Gossip!! Awesome craft Angie!Really, really love your intro too. I made quite a few lego contraptions today at the cost of work left undone…trying to cherish the moments I’ve been blessed with and praying constantly for those whose lives were affected directly. These are so cute, they would make great grandparents gifts! Oooh goodness. We have more than a few bottle caps laying around in the recycling area. Might as well put them to good use! 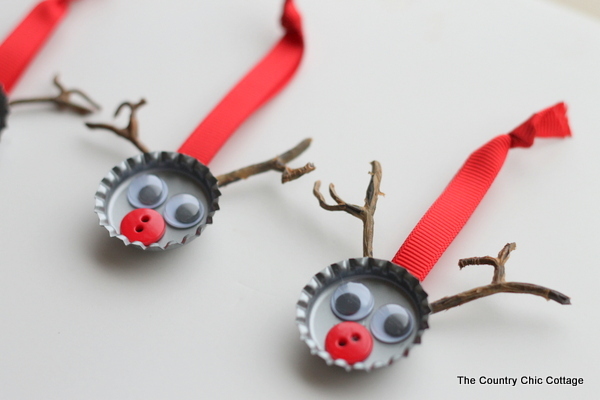 I’ve been using red M&Ms as our red noses for reindeer crafts because I haven’t got anything else red on hand. Hope they’ll fit in a bottle cap! That is adorable!! I might have to do this with the cousins at my Mom’s house this weekend! Thanks for sharing!! These are too cute! I am pinning, my kids would love to make some! Yep you can get them at the craft store! Do they sell the bottle caps at a craft store? How precious! 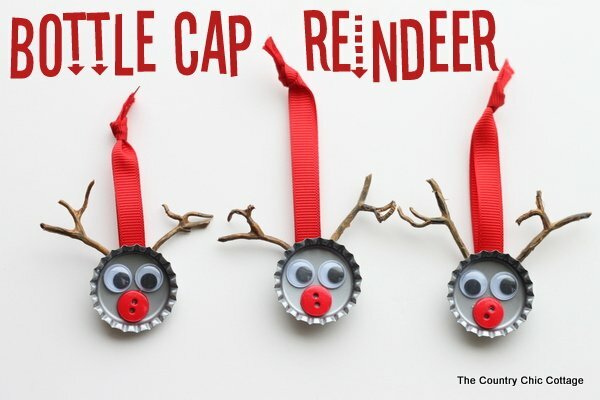 I will have to make these with my kids for our tree. We have been needing some new ornaments. I’ve never seen y Faux Sticks lke that, where did you purchase those? My 2 little boyz & I want 2 make some as gifts:) Thanks 4 posting these! Just stumbing across this craft…. wondering if by any chance you found those little faux sticks anywhere? I’ve treid Amazon and all of my local craft stores with no luck. Browse the silk flower section of a large craft store or Old Time Pottery perhaps? I wonder if toothpicks just broken and glued together would work? You could just dip the ends in white glue and then let them dry. Wondering if anyone found a way to add the “year” to this lovely activity?! Having to glue the ribbon and faux sticks to the back of the cap left us with no room to write it on there. Any ideas would be greatly appreciated! What if you added it to the ribbon?